Stems: Erect, usually solitary, simple or few-branched upward, stiff-hairy, sometimes nearly glabrous near base. Leaves: Mostly opposite or uppermost sometimes alternate, short-stalked, divergent or ascending, thick, lanceolate to narrowly ovate, 2.8 to 7.2 inches long, .6 to 2.4 inches wide, not folded longitudinally; surfaces stiff-hairy, upper surface rough; veins 3, 2 lateral veins branching upward from central vein near base of blade; margins toothed to rarely entire; tip tapering to sharp point; base rounded or contracted. Inflorescences: Heads, to 3 inches across, 1 to several, terminal or appearing as open cluster; stalks short, stout; bracts in 3 or 4 nearly equal, overlapping series, narrowly linear-lanceolate to lanceolate; tips ascending to spreading or recurved, tapering to slender, sharp points; margins fringed with short hairs. 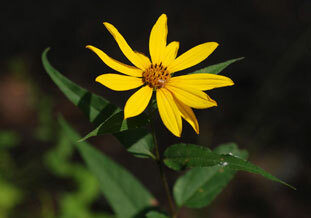 Flowers: Ray florets 10-15, .6 to 1.2 inch long, yellow, outer surface minutely pubescent; disk florets yellow, 1/5 to 1/4 inch long; chaffy bracts shallowly 3-toothed, pubescent at tips. Fruits: Achene, wedge-shaped to egg-shaped, 1.6 inch long, somewhat flattened, brown, glabrous, tipped with 2 lanceolate to narrowly triangular scales that taper to awn-like tips, enclosing small seed. Habitat: Rocky or dry open woods, thickets, roadsides, sand prairies, banks of streams, disturbed areas. Distribution: Principally east 2/5 of Kansas. Uses: White-tailed deer eat the heads. Comments: Often grows in colonies.